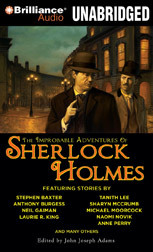 “When you have eliminated the impossible, whatever remains, however improbable, must be the truth.” This famous Sherlock Holmes quote is the impetus which drives this intelligent, inventive, and at times irreverent compilation of Sherlock Holmes stories written in the last few decades. As John Joseph Adams explains in his introduction, his aim in compiling these stories is to explore the uneasy peace between the cold clear logic of the deerstalker-wearing, pipe-smoking detective and the unanswered, perhaps unanswerable mysteries which continue to thwart human investigation to this very day. While many of the stories miss the mark of this goal entirely, the collection as a whole succeeds in pushing Holmes in new directions while staying true to the spirit of Sir Arthur Conan Doyles’s original work. The stories in this collection fall into one of three categories. First, there are the traditional mysteries. These are stories that, with but slight alteration, might easily have found a home among Conan Doyle’s own work. The best of these tales expand upon characters or cases mentioned in the original œuvre only in passing. Mrs. Hudson’s Case by Laurie R. King, for instance, features Holmes’s protégé Mary Russell as its protagonist and reveals the character of Holmes’s long-suffering landlady. Edward D. Hoch’s A Scandal In Montreal, meanwhile, reunites Sherlock Holmes with his sometime nemesis Irene Adler. As a whole, however, this category fits rather uneasily into the collection because, by and large, there is little in the way of “the improbable” in any of these stories. All are well-written and most are engaging; they simply miss the point. The second category I would call historical, or pseudo-historical. In most respect these stories are similar to those of the first category, with one redeeming addition: Sherlock Holmes crosses paths with historical figures from the Victorian era. Stephen Baxter’s The Adventure of the Inertial Adventure sees our detective join forces with author of scientific romances H.G. Wells, while Tony Pi’s Dynamics Of A Hanging brings mathematician Charles Dodgson (better known as Lewis Carroll) into the Holmesian world. The highlight of this grouping, though, is The Adventure Of The Field Theorem by Vonda N. McIntyre, in which Sherlock Holmes investigates crop circles at the behest of none other than Arthur Conan Doyle. The last category throws Sherlock Holmes–and let’s not forget Doctor Watson, through whose eyes we see most of these tales unfold–into genres as wide-ranging as alternate history, horror, and science fiction. Subjectively, I liked these stories best because they fall into genres which I most commonly read. Objectively, these stories succeed because they deliver on the promise of “improbable adventures.” The collection opens with a chilling tale by horror master Tim Lebbon, which unlike most Holmes stories is never intellectually resolved. The Singular Habits Of Wasps by Geoffrey A. Landis, perhaps my favorite story in the collection, puts a fascinating otherworldly spin on the mysterious murders of Jack the Ripper. Robert J. Sawyer’s closing story, You See But You Do Not Observe, pits Holmes’s intellect against the fermi paradox concerning extraterrestrial life. The collection is worth the price of admission for these entries alone. 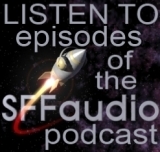 Simon Vance carries the bulk of the narration, with Anne Flosnik reading only a few stories featuring female protagonists. Flosnik performs solidly in her few appearances. Simon Vance’s portrayal of Holmes and Watson is spot-on; the former speaks with a whip-sharp voice, while the latter lumbers along in a more lugubrious manner. He falls short only when narrating the few “New World” characters who figure in the stories, but these cases are uncommon and Vance’s accent isn’t off by much. John Joseph Adams himself narrates the collection’s introduction, as well as introductory passages to each story. Whether you’re a fan of mystery, history, or something further afield, chances are high you’ll find something to sate your appetite in The Improbable Adventures of Sherlock Holmes. I’ll venture out on a limb and say that visitors to this site will likely be most interested in the tales of speculative fiction. I assure you, in particular, that you’ll not be disappointed. Thanks for posting this – yep, it’s identical! Good stuff.